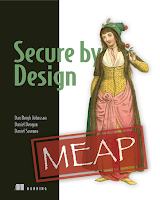 This article is an excerpt of topics discussed in the book Secure by Design that I'm currently writing together with Dan Bergh-Johnsson and Daniel Deogun. This article discusses the properties of the model objects known as entities and how they function inside the domain model. Knowing about fundamental Domain Driven Design (DDD) concepts such as entities is a great way to start your Secure by Design journey – here is what you need to know to be ready to dive in. If you want to, you can save 37% off Secure by Design with code fccsecure at manning.com. It has an identity that defines it and makes it distinguishable from others. It has an identity which is consistent during its lifecycle. It can contain other objects, such as other entities or value objects. It’s responsible for the coordination of operations on the objects it owns. What this means is that if we need to know if two entities are the same, we look at their identities instead of their attributes. It’s the identity of the entity that defines it, regardless of its attributes, and the identity’s consistent over time.